Recently I commiserated with a friend who was packing up her family home as it had been sold. (Cue audible sigh) It’s always hard moving house, physically it’s a nightmare and emotionally it’s just plain tough. So many memories, not all of them good, but all of them particular to the lives that are played out within those walls. It didn’t help my friend that it rained for an entire week during the packing and detaching process. I was reminded of an art installation I saw last year as part of Sydney’s Art and About festival. 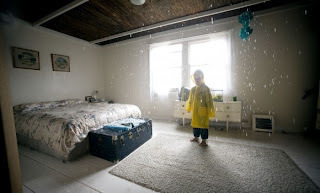 The installation, called I Wish You Hadn’t Asked by James Dive from The Glue Society creative collective, was a fully furnished house, erected in the middle of city, that rained on the inside. For two weeks, furniture, bedding, appliances, toys, artworks, books and clothing deteriorated as 200 litres of recycled water rained down on them – gradually destroying this little time capsule of family life; symbolising a relationship falling apart. To experience the installation you donned a raincoat and entered through the front door. At the time I visited it had been raining on the inside for over a week. I found the surreal Dali-esque scene of molten belongings - the ruined trappings of a familiar life - and the stench of decay extremely confronting. I couldn’t get out of there quick enough; tears streaming down my face by the time I exited the back door. I know it's not material possessions that define "home" but after the boxes are filled, and you’ve dealt with the dust bunnies that remain when the furniture is removed, somehow an empty house doesn’t feel like home any more. It took my lot six months to come to terms with our latest move. (Or was it just me?) Eventually we stopped calling it “that house” and now we belong (albeit in a state of flux for the last year - see Cabin Fever), the sounds and smells and chaos of family life - arguments and laughter - filling the spaces up. Just catching up and I think I know who that friend is. I would have found that installation really confronting too - and am glad that for all the houses that it may have symbolised there are plenty of homes which it does not.